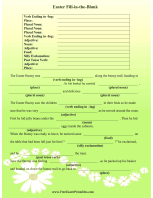 This printable letter should be left for an adult to find on Easter morning instead of a candy basket. 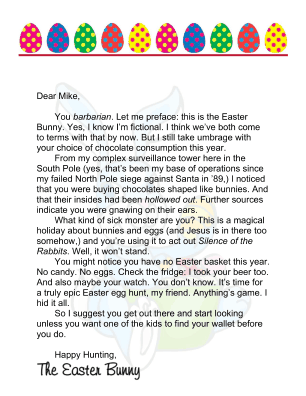 The Easter bunny scolds the grownup about eating chocolate rabbits and promises that all the adult's possessions have been hidden in an egg hunt outside. You barbarian. Let me preface: this is the Easter Bunny. Yes, I know I'm fictional. I think we've both come to terms with that by now. But I still take umbrage with your choice of chocolate consumption this year. From my complex surveillance tower here in the South Pole (yes, that's been my base of operations since my failed North Pole siege against Santa in '89,) I noticed that you were buying chocolates shaped like bunnies. And that their insides had been hollowed out. Further sources indicate you were gnawing on their ears. What kind of sick monster are you? This is a magical holiday about bunnies and eggs (and Jesus is in there too somehow,) and you're using it to act out Silence of the Rabbits. Well, it won't stand. You might notice you have no Easter basket this year. No candy. No eggs. Check the fridge: I took your beer too. And also maybe your watch. You don't know. 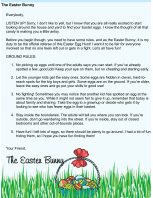 It's time for a truly epic Easter egg hunt, my friend. Anything's game. I hid it all. So I suggest you get out there and start looking unless you want one of the kids to find your wallet before you do.